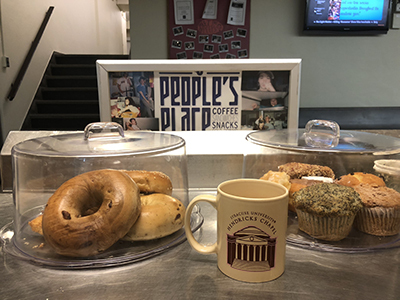 People’s Place, in the basement of Hendricks Chapel, offers drinks and snacks. People’s Place is percolating with summer promotions. The student-run coffee shop in the lower level of Hendricks Chapel invites staff and students attending the Strawberry Festival to stop in Friday, June 8, for a $1 iced coffee. Got a mug? Bring it to People’s Place year-round for a discounted fill up; $1 for hot coffee or a $1.50 for iced. People’s Place accepts cash and—as a convenient new option for customers—is now offering reloadable gift cards available in any amount. In keeping with its reputation as the coolest coffee shop around, People’s Place is proud to announce its new Pay It Forward promotion. Donate toward the next customer who may have forgotten their wallet—or who is short on cash. Be cool this summer and follow People’s Place on social media for more promotions and specials. The shop is open every weekday 8 a.m.—2 p.m. offering fair-trade coffee, bagels, baked goods and an array of beverages and snacks.